Wait…. hold the press…. Can you really make home fries without potatoes? Have you ever heard of yuca root? Perhaps casssava might ring a bell? Still no? No worries…. Me too, until recently when Mr. B and I stumbled upon some waxy yuca for sale. I’ll admit I had seen it there before, always curious and pondering as to what it was and how someone would prepare it. We used our trusty source Google. (Go ahead Google it too). We found out that there were some surprisingly outstanding benefits to eating yuca root. For starters it’s a great source of vitamin C, phosphorous, and calcium. Yuca is also high in fiber and plays a crucial part in good intestinal health. Can’t get better than that, right? Wrong, it gets better! My fellow followers, the tasteeeee! It was just AS GOOD as the typical American carbolicious comfort of home fries we grew up on. If it wasn’t for yuca being a tad bit starchier, I honestly don’t think I’d be able to tell the difference. We recently bought a griddle for our teeny tiny Korean stove top. Essentially this griddle is for a grill, however it works quite nicely for us in our kitchen. 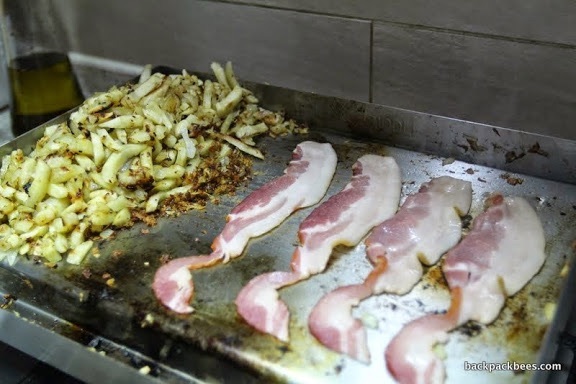 Sunday morning came around and we thought how perfectly the new adventures of yuca and the new griddle would work together. We really do not have a recipe per say. Just treat yuca like you would a potato. Get rid of the waxy exterior, process in a food processor, or chop by hand how you’d like your home fries. Next heat up some safflower oil, or your favorite oil on your griddle, or large pan and fry those babies up! Don’t forget a side of bacon and dippy eggs with cheese too. Looking back, thinking about the incredible aromas wafting from our kitchen, it was as if we were in an episode of Diners, Drive-Ins and Dives (Triple D!) grease splatter and all. We like to keep it rather authentic like that. HA-HA, yeah our good friends know that only 5 seconds would pass and Mrs. B would be running around like a mad woman wiping it up immediately. Have you ever made or tried yuca? We’d love to know some recipe ideas if you’d be willing to share.